Here's how to implement a full width, responsive modal pop with the Twitter bootstrap. In this article, let us explore how to make responsive full width modal popup using Twitter bootstrap. This is one of the latest trend in web design which I came across several times and I found it very attractive. You can see a good example of this here and this is done using plain css3 media queries, transitions and html5. So I am going to explain how this can be achieved easily using Twitter bootstrap modal popups. In case, you want to quickly bring up your portfolio website or if you are already using Twitter bootstrap in your website, then this tutorial will be of much help to you. Initially, we will have four blocks on the page and on clicking each block, the details will be opened in a modal popup that occupies full screen. 1. 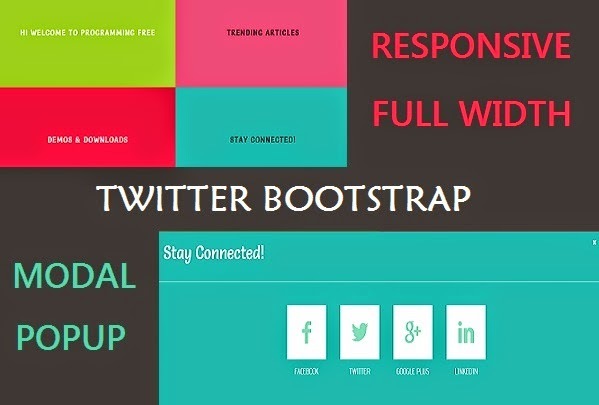 First step is to download twitter bootstrap library from here. Unzip the contents in a directory. 3. Open index.html in a text editor and copy the below contents to it. In the above code, wherever you find "MODAL POPUP CONTENT" replace it with the content you want to display in the modal popup. That is all! I have just copied the code for displaying modal popup from here and then added a small tweak to make the modal popup expand to full-width of the screen. Note: Make sure to have the contents in your modal popup to be responsive with the grids provided by Bootstrap. Published at DZone with permission of Priyadarshini Balachandran , DZone MVB. See the original article here.